The Delhi High Court today issued notice to Lok Sabha Speaker Som Nath Chatterjee on a petition by MP Lal Chandra Kol, challenging his expulsion from the House for his alleged involvement in the “cash-for-query” scam. This is the first notice issued to the Speaker, who had made it clear that the courts have no jurisdiction in the matter and had gone to the extent that he would not respond to any notice by any court on the issue. Should women be employed as bartenders in hotels and pubs? At least 44 Indians were among 362 persons killed in yesterday’s stampede at Mina during the stoning ritual at the Haj pilgrimage. Reports quoting Saudi Interior Ministry said today that according to preliminary figures there were 44 Indians, 37 Pakistanis, 28 Saudis and people from 23 other countries among the dead. Opening a window of employment opportunities for the state’s jobless youths, Chief Minister Amarinder Singh today announced that the state government would soon launch a massive recruitment drive in all the departments to fill the vacant posts on regular basis. 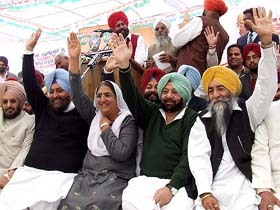 Punjab Chief Minister Amarinder Singh and Deputy CM Rajinder Kaur Bhattal at the party’s Maghi conference in Muktsar on Friday. Though infiltration across the LoC may have reduced, terrorists are using other ways to sneak into India. The Supreme Court today declined to have an urgent hearing on a petition raising the issue of government’s stand on “defreezing” of the bank accounts of Italian businessman Ottavio Quattrocchi, in which the alleged Bofors payoff money was deposited. The first Indo-US high-level meeting on civilian nuclear programmes after the July 18 landmark agreement between the two countries concluded here yesterday, according to the Department of Atomic Energy. The meeting in the form of a workshop was held between January 9 and 12. The stage is set for the first expansion of the Bhupinder Singh Hooda Cabinet. The new Ministers will be administered the oath of office and secrecy by the Governor, Dr A.R. Kidwai, at Haryana Raj Bhavan at 1.30 p.m. tomorrow. Dr Raghubir Singh Kadiyan, MLA from Beri, is the new Speaker of the Haryana Vidhan Sabha. 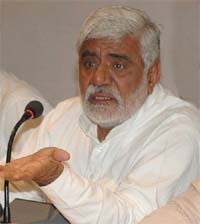 Dr Kadiyan, a three-time MLA, was elected Speaker after Mr H.S. Chatha resigned in view of his impending induction into the Hooda Cabinet. His election was, however, not without hiccups.